The DPI Game Fish Tagging Program is the largest saltwater tagging program of its kind in the world and has been in operation since 1973. 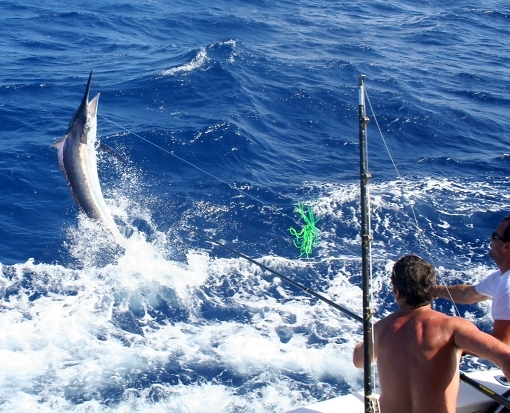 It is used to obtain information on the biology (distribution, movement, growth, exploitation) of billfish, tunas, sharks and sport fish and encourages game fishers to participate in the management of the fishery. Since the program commenced, over 460,000 fish have been tagged and over 8,000 fish recaptured. Of the 60 species recognised by the Game Fishing Association of Australia (GFAA) it has been found that 10 species of fish tagged by the DPI Game Fish Tagging Program account for 70% of all fish tagged. Tags are issued to anglers and when an angler catches a fish it is tagged and released. The details of the capture are recorded on a tag card with the corresponding tag number. The card is returned to DPI. When a tagged fish is recaptured, catch information is linked to the original tag and release and compared to the recapture information. Details of the distance that the fish travelled and its growth are sent to the anglers who first tagged the fish and the anglers who recaptured it. A recapture certificate is also issued. The tagging data is used by scientists to study the lives and habits of these fish species. The migratory habits of the tagged fish are observed by measuring the distance and direction travelled between tagging and recapture, and this can be linked with environmental factors. Growth patterns are also monitored. The observations also enable scientists to study the structure of fish stocks and assess whether there is any mixing between populations that are geographically distant from one another. This information is vital to improve the understanding and management of valuable game and sport fish species. Our data has been used in the following paper: Dispersal of Adult Black Marlin (Istiompax indica) from a Great Barrier Reef Spawning Aggregation. See the distribution of the three marlin species tagged under the NSW DPI Game Fish tagging Program over the last five years (1/7/10 – 30/6/15). Note: All other fish including freshwater, endangered, protected and vulnerable species are not to be tagged under the NSW DPI Game Fish Tagging Program. All tagging undertaken by DPI is research-based and coordinated to respond to specific research needs. The tagging program and the eligible species list are carefully managed and have associated animal welfare approval. Please contact DPI if you believe your local fishery has specific research requirements. DPI records the boats and anglers that have provided exceptional contributions to the program over the past seasons. Subscribe to our Tag Times newsletter.